Tonight’s meal came together so quickly and was so delicious that I had to blog it immediately!! 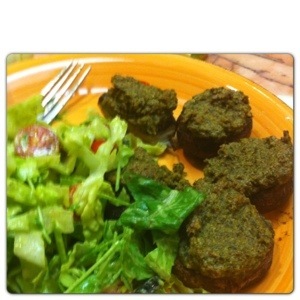 We had Dandelion Pesto Stuffed Mushrooms. First, you need to prepare your shrooms. Rinse them, pat them dry and remove the stem. Reserve about one fourth of the best looking stems. Put the caps in a big bowl and drizzle some good quality olive oil and a small amount of tamari or Nama Shoyu on them. Set aside to marinate while you prepare the rest. Next, you want to make a vegan pesto. You can use any recipe that you like, but if you don’t have one then I’ll tell you what I did. Process again, and add in while the machine is running a few good glugs of the best olive oil you can afford! It is worth it for a good pesto!! Also add in the juice of half a lemon or a bit of apple cider vinegar. This is your basic pesto. To this, add in the reserved mushroom stems (peduncles!) and about half a cup of raw crackers. I used my own brand onion crackers, but you can use anything!! Process again until smooth and thick. Now fill each mushroom cap with about a tablespoon of the pesto mixture. You can either eat them as is, dehydrate them at 120 for 4 to 6 hours or you can even bake them at 350 for 15 minutes. Either way, they are delicious and sure to please even the most discerning palates. Serve with a salad and you have a perfect meal. If you made it this far, you deserve a picture! Our salad had romaine, cherry tomatoes, black olives, pea shoots and a simple parsley and apple dressing. Yum! Hope you enjoy! Let me know if you try it.